GRAMMY® award winner JASON CRABB was joined by some very special guests during his performance at the 49th Annual GMA Dove Awards this past Tuesday, October 16, 2018 – multi-award winning superstar vocal group, RASCAL FLATTS. Flatts’ member JAY DEMARCUS produced Crabb’s latest release, Unexpected, and the group joined Crabb to perform “You Chose To Be My Friend” featuring a duet with Flatts’ member, Gary LeVox. Earlier in the evening, Crabb garnered his 22nd GMA Dove award for the song, “Washed By The Water,” from his latest release,Unexpected. The 49th Annual GMA Dove Awards will be broadcast on TBN on Sunday, October 21, 2018 at 9 PM ET / 8 PM CT.
For more information on the GMA Dove Awards, visit www.GospelMusic.org. 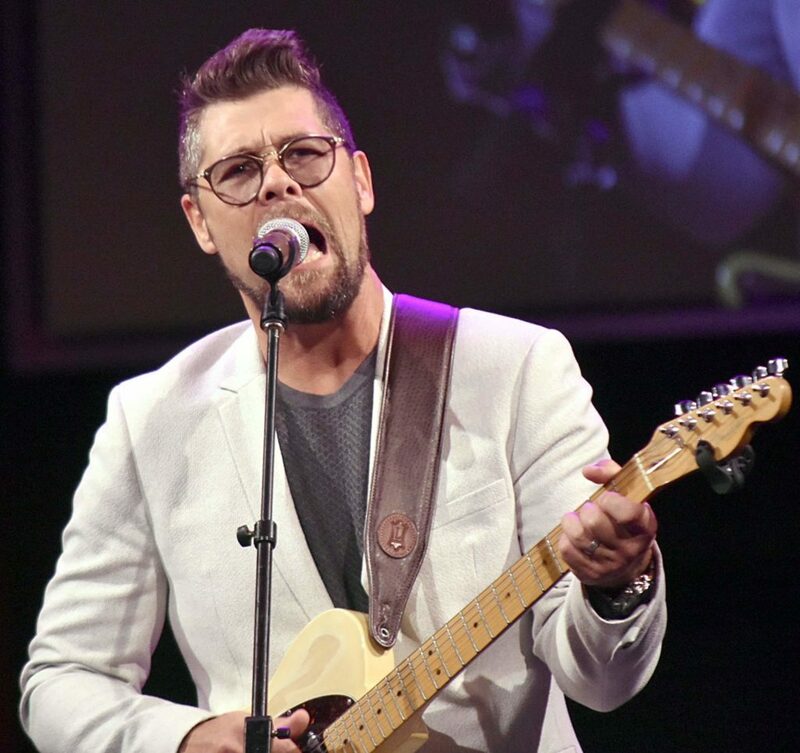 For more information on Jason Crabb, visit www.JasonCrabb.com. Dahlonega, GA (August 9, 2018) Five-time Grammy-nominated and six-time Dove Award-winning family group Karen Peck and New River were honored with two nominations for the 2018 GMA Dove Awards. The group received the coveted Southern Gospel Artist Of The Year nomination as well as the as the Southern Gospel Album Of The Year for Hope For All Nations. The group’s producer Wayne Haun also received a nomination for Producer of the Year. 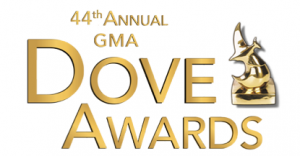 The 49th GMA Dove Awards take place in Nashville, TN, at Lipscomb University’s Allen Arena on October 16. The 2018 Dove Awards will be taped to air on Trinity Broadcasting Network on October 21. To learn more about Karen Peck and New River go to the group’s website. To book Karen Peck and New River contact The Harper Agency. NASHVILLE, Tenn. (October 12, 2017) – Joseph Habedank is preparing to share the stage with an international bonafide superstar – Reba McEntire. 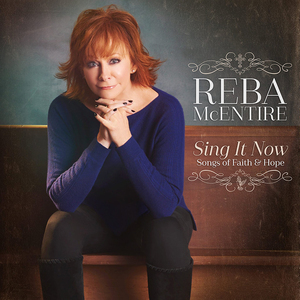 Habedank, who wrote the title track to McEntire’s latest release, Sing It Now, will join the beloved star on stage to perform with her during the 48th Annual GMA Dove Awards to be held on October 17, 2017 at Lipscomb University’s Allen Arena. TBN will exclusively air the awards show on October 22, 2017 at 8 PM CT. The special performance comes on the heels of his win for Favorite Soloist of the Year during the Singing News Fan Awards at NQC 2017 just a few weeks ago and a busy year for Habedank. The performance details will be a surprise as producers of the show are keeping everything under wraps until the night of the appearance. The GMA Dove Awards celebrate the contributions of artists from every style of Christian/Gospel music. Top nominated artists include Zach Williams, Lauren Daigle, Chris Tomlin, Kirk Franklin and NEEDTOBREATHE. For more information, visit www.DoveAwards.com. For more information about Joseph Habedank, visit www.JosepHabedank.com. 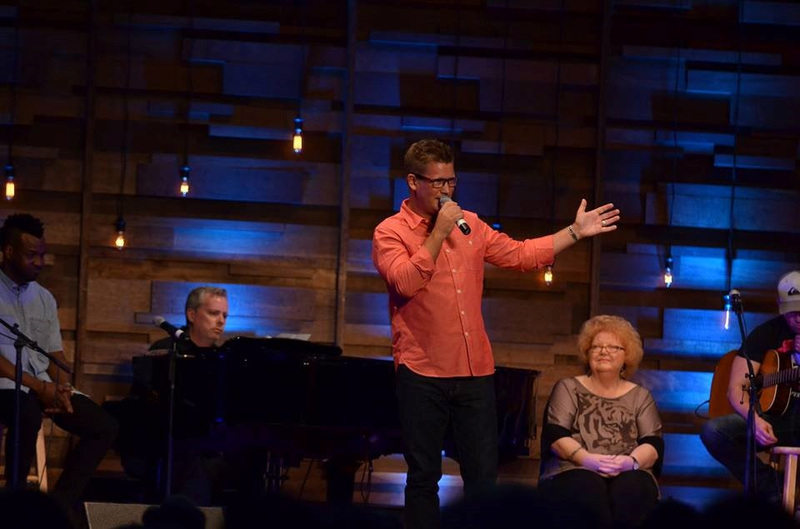 Hendersonville, TN – Talent was not in short supply Tuesday night in the Van Ness Auditorium at the LifeWay Christian headquarters. Several of the industry’s top singers and songwriters performed to a full house of aspiring artists, songwriters and industry professionals attending GMA’s sold out IMMERSE conference this week in Nashville, TN. Award winning singer/songwriters Brandon Heath and Chris August kicked off the evening, hosted by Ed Cash, that went on to feature one chart topping song after another, as well as moving stories from the writers about the personal struggles that inspired the now well-known lyrics. All genres of Christian music were well represented and received with an overwhelming enthusiasm by the audience, as well as the songwriters themselves. Representing Southern Gospel was Daywind singer/songwriter Joseph Habedank, as well as Daywind’s songwriting veteran, Dianne Wilkinson. Habedank wowed with an acoustic version of his recent radio hit, ‘Never, No Never,’ accompanied by co-writer Lee Black on the piano. 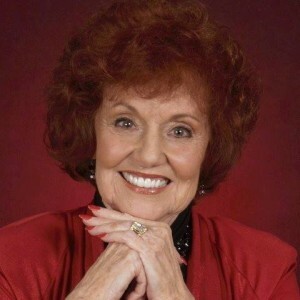 Wilkinson, the self-proclaimed ‘Momma’ of the group, offered inspiring words of encouragement to the younger writers before inviting the Kingdom Heirs on stage to perform her song, ‘The Joys Of Heaven.’ Both performances were met with standing ovations from the eager crowd. SGN Scoops writer and Gaither homecoming favorite, Lou Wills Hildreth, is currently recovering at home following ankle surgery. Lou is under the care of her husband Howard, their son Dr. David Hildreth and daughter Kathryn Mumaw. Lou is well known in Southern Gospel and is recognized as a member of both the GMA and Southern Gospel Music Association’s Halls of Fame. Please join us in praying for Lou’s healing. She would love to hear from all who are praying for her. Please write to Lou at PO Box 271106, Houston TX 77277. Email can be sent to gosplvideo@aol.com. NASHVILLE, TN (March 22, 2013) – The Gospel Music Association (GMA) recently announced the return of the legendary GMA Dove Awards to Music City for its 44th year of honors. For the first time in GMA Dove Awards history, Gospel music’s biggest night will take place in the fall. This year’s show is on Tuesday, October 15, 2013, at 8 p.m. EDT, at Allen Arena on the campus of Nashville’s historic Lipscomb University and will be nationally televised on GMC TV. The bold move from spring to fall was an intentional shift by the Gospel Music Association to make this year’s esteemed event an unforgettable celebration of the message and artistry that defines the Gospel/Christian genre leading into the industry’s most significant retail sales season. 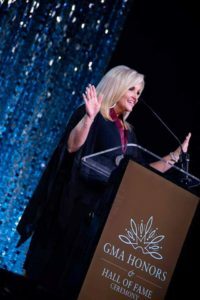 “The GMA Dove Awards has a tradition of bringing our music community together to celebrate God’s goodness as a family and raising awareness for Christian and Gospel music,” says GMA Executive Director Jackie Patillo. The memorable evening will celebrate the impact Gospel music is making in the lives of countless listeners around the world through story and song. “This year we will not only pay tribute to the music and its makers, but we will shine a light on those who have experienced the music as a lifeline,” says Patillo. In addition to once-in-a-lifetime performances, the show will also highlight the efforts of the industry’s artists who are using their platforms to champion causes greater than themselves. Food for the Hungry, which provides emergency relief and long-term development programs to help the world’s most vulnerable people, will be this year’s GMA Dove Awards ministry partner. The organization will help celebrate the efforts of the industry to communicate its message of hope and service. GMC TV will telecast the ceremony to its more than 60 million households nationwide. “As America’s leader for uplifting entertainment, we are proud to be the exclusive home of the 44th Annual GMA Dove Awards as they celebrate two of our most successful genres of programming – music and movies,” said Charles Humbard, president and CEO, GMC TV. The city of Nashville is thrilled to see the prestigious awards show return to Music City, the hub of Gospel/Christian music. “The Christian and Gospel music industry plays an important role in the energy of our city’s music scene, and, as Music City, we are proud to welcome the Dove Awards back to Nashville,” Mayor Karl Dean says. The GMA also revealed that it will add a feature film category in response to the rise in prominence and impact of inspirational films within the entertainment community. GMA has invited The Dove Foundation, known for its Dove Seal of approval for filmed entertainment, to participate in the development of the category and to ensure the creditability of this award. Final nominees are scheduled to be announced on Tuesday, August 22, 2013. Hosts and performers, along with ancillary Dove-related events, will be unveiled in the coming months. Only GMA members are eligible to vote in the 44th Annual GMA Dove Awards. To vote and further support this community, membership by March 30, 2013, is required. Visit www.gospelmusic.org to learn more about the GMA’s mission, along with details on member benefits and application information. Tickets for the 44th Annual GMA Dove Awards will go on-sale to the public June 7, 2013. To view eligibility period and entry details, visit www.doveawardsvoting.com. For all other GMA Dove Awards information, visit www.doveawards.com. 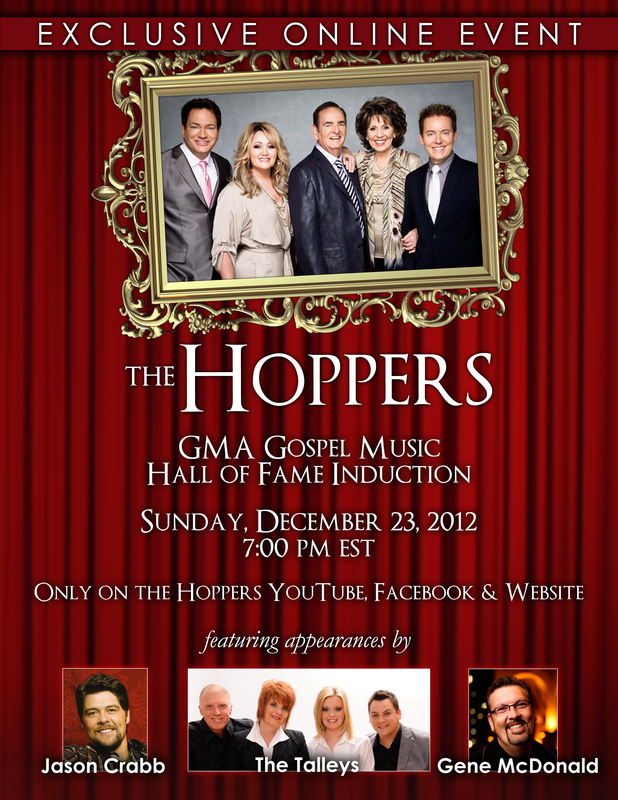 The Hoppers – GMA Hall of Fame Induction Ceremony — Sunday December 23 7:00PM est. “Fifty-five year veterans of Gospel music, The Hoppers, were recently inducted into the Gospel Music Association Hall Of Fame. Posted in announcements | Comments Off on The Hoppers – GMA Hall of Fame Induction Ceremony — Sunday December 23 7:00PM est. NASHVILLE, Tenn. – August 3, 2012 – An unforgettable night of tributes and performances will be featured at the GMA Gospel Music Hall of Fame Induction Ceremony on Tuesday, August 14, 2012 (7:00 PM CST) at Trinity Music City in Hendersonville, TN. Dailey & Vincent, Dottie Peoples, Gordon Mote, Greg Long, The Isaacs, Jamie Grace, Michael W. Smith and The Talleys are among the artists set to provide recognition to this years inductees: Aretha Franklin, The Hoppers, Rex Humbard, Ricky Skaggs and Love Song. Jason Crabb and Jaci Velasquez will host the evening’s festivities. This year marks the 39th anniversary of the GMA Gospel Music Hall of Fame which was established in 1971, and has inducted more than 150 members since its inception. Previous inductees include Johnny Cash, DeGarmo & Key, Dolly Parton, Elvis Presley, Mahalia Jackson, Amy Grant, the Statler Brothers, the Winans, the Blind Boys of Alabama, Andrae Crouch, Sandi Patty, Andrae Crouch & the Disciples, Vestal Goodman, Tennessee Ernie Ford, Shirley Caesar, The Oak Ridge Boys, the Blackwood Brothers, Petra, Bill Gaither, Gloria Gaither, the Happy Goodman Family, Larry Norman, George Beverly Shea, Albertina Walker, The Imperials, Pat Boone, Dottie Rambo, Evie, Larry Norman, Richard Smallwood, Jake Hess, The Lewis Family, Cliff Barrows, Thomas A. Dorsey, the Cathedral Quartet, the Fairfield Four, Billy Graham and The Jordanaires. The Gospel Music Hall of Fame is dedicated to fostering an appreciation of the historical development of gospel music and its impact on our culture by collecting, preserving, exhibiting and interpreting its collections for a global audience, as well as honoring those who have made outstanding contributions to gospel music. For a full list of GMA Gospel Music Hall of Fame Members click here. MOBILE, Alabama (January 5, 2011) – Integrity Music announces the February 22 U.S. release of Level Ground, an innovative CD and DVD project from award-winning Canadian worship leader/songwriter Brian Doerksen. The Covenant, Juno and GMA International Award winner was inspired by a unique concept for Level Ground. Doerksen wanted to produce a live recording that placed the musicians and singers among the worshippers and embraced the intimacy and simplicity of a small group while reserving the stage for people to share stories of grace. The live recording took place at “The Barn,” a gathering place in Doerksen’s hometown of Abbotsford, B.C. The result: a 13-song CD and a DVD that features music and inspiring stories of lives transformed by the power of God. The Level Ground DVD is a two-hour film that brings together a hybrid of several elements – it’s part concert film with all the songs from the CD (plus a new version of “Broken and Beautiful”) and part documentary with interviews, “grace stories” and behind-the-scenes footage. The Level Ground CD features new songs written by Doerksen along with co-writes by Paul Baloche, Kathryn Scott and Doerksen’s longtime collaborator/producer Phillip Janz. In addition to the CD and DVD, Level Ground worship resources (trax/songbook/digital songbook) are available. 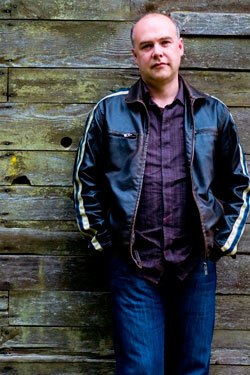 Brian Doerksen is more than a songwriter and worship artist. He is also an author, conference speaker and pastor. His songs, which are sung in churches around the world, include “Come, Now is the Time to Worship”, “Hope of the Nations”, “Faithful One”, “Refiner’s Fire”, “Hallelujah (Your Love is Amazing)” and “Holy God”. He has recorded six albums in partnership with Integrity Music – Level Ground; It’s Time; Holy God; Live in Europe; Today and You Shine. In 2008, Doerksen received a JUNO award (Canadian equivalent of the GRAMMY Awards) for Holy God (Contemporary Christian/Gospel Album of the year). 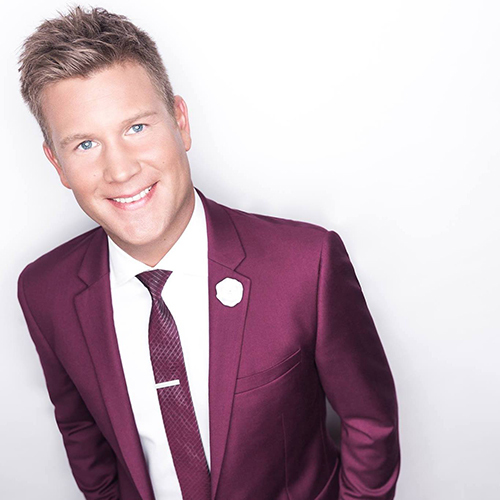 For creating worship music that has impacted the global Church, he was honored by the Gospel Music Association with its “International Award.” In addition, he has received numerous Covenant Awards from Canada’s Gospel Music Association. Born and raised on the west coast of Canada in Abbotsford, Doerksen now lives with his family (wife of 26 years Joyce and their 4 youngest children) in the same home that he spent his childhood in. He continues to make his church home at ‘The Bridge’ in Matsqui village in Abbotsford, which he helped plant in the spring of 2006. For more information on Brian Doerksen, visit www.briandoerksen.com or www.integritymusic.com. For a video preview of the project, visit http://www.youtube.com/integritymusic#p/search/1/he9ed_zoVlg.